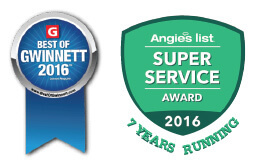 Atlanta-area lawn care provider Arbor-Nomics Turf is pleased to announce its first Best of Gwinnett win and seventh consecutive Angie’s List Super Service Award. As previously announced, the 2016 award year also saw Arbor-Nomics make the Inc. 5000 list of the fastest growing privately held U.S. companies for the eighth consecutive year. Gwinnett Magazine, with an estimated readership of 75,000, publishes a special issue each year featuring that year’s Best of Gwinnett companies. Winners are determined by a combination of reader votes and opinion polls. According to gwinnettmagazine.com, reports from the Better Business Bureau, information from various ranking sites, and analysis of voting patterns are used to vet the results of reader polls before winners are decided and announced. To win the Angie’s List Super Service Award, a company must first meet a threshold for number of customer reviews. It then needs to maintain straight A’s for the entire review year in each of the categories used to measure customer satisfaction, such as price, professionalism, dependability, and quality. In addition to Best of Gwinnett, Angie’s List Super Service, and Inc. 5000 recognitions, Arbor-Nomics is a perennial Home Reports Best Pick company, is endorsed by TrustDALE.com, and has been named one of Atlanta’s Best and Brightest Companies to Work For. Arbor-Nomics provides lawn and ornamental tree and shrub care to homeowners throughout the metro Atlanta area. Its three year-round treatment programs and as-needed services are structured to fit different budgets and needs. The company’s field technicians receive training and education that surpass industry practices and requirements.